Oceláři Třinec, who trailed their semifinal series with Slavia Praha 3-1, came back with three straight wins to take the series. This sets up an all-Silesia final series between the aforementioned Třinec and Vítkovice Steel, which begins Monday. series. Photo: Marian Ježowicz, hcocelari.cz. 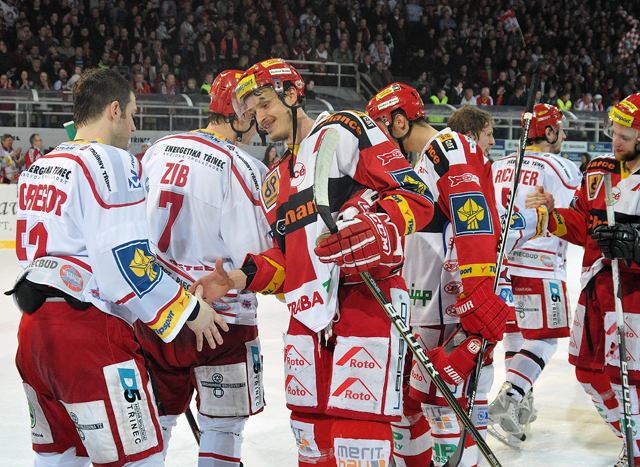 On Friday night, Třinec hosted Slavia in game 7 of the semifinal and got off to a quick start, when David Květon scored after only 47 seconds of play. That was the only goal of the opening period, but Třinec busted it open with three goals in a 3:13 span midway through the second that chased goaltender Miroslav Kopřiva from the game. After being given much of the credit for Slavia's 3-1 lead early in the series, Kopřiva was pulled from two of the last three games, and was criticized for allowing two bad goals in game 6. Two of Třinec's goals in that span were power-play markers by defenceman Lukáš Zíb, the second coming after Slavia rookie Dmitrij Jaškin was assessed a major and game misconduct for checking from behind. Slavia scored twice in the third, but that wasn't enough to get them back into the game, and it finished 5-2. Though they were heavy underdogs going into the series, the loss is a bitter pill to swallow after holding a 3-1 lead in games, and also leading by a score of 3-1 in game 6 on home ice. "It is a pity that we could not win the sixth game at home," said coach Vladimír Růžička after the game. "But I must admit that in the previous two home games we were very lucky. The sixth game, unfortunately, we made a lot of mistakes with promising lead." Růžička went on to speak about his team's shortcomings on specialty teams, their lack of a game-breaker like Martin Růžička (no relation), who had an incredible 16 points in the series, and general lack of experience. "Nevertheless, I would like to thank the players for what they showed in the playoffs." While Martin Růžička was the star of the series, it was Zíb's two big goals that made him the hero of the decisive game. "This series we showed great character and strength of the team," the veteran blueliner told Dnes's Martin Stebel after the game. "We have a great group. We showed great resilience when the series wasn't going well. Although we were down 1-3, I didn't feel like we were the worse team. We were really the better squad, but unfortunately we weren't converting on our chances. By no means did we pack it in. The series also showed our fantastic fans who have helped us much." Třinec has two days off without travel before the final starts Monday. They will host a Vítkovice club that will have had six days of rest. After games Monday and Tuesday in Třinec, the series moves 50 kilometres northwest to Ostrava for the third and fourth games next Friday and Saturday. A possible seventh game would go on April 16. A great comeback by Trinec sets up a terrific derby with Vitkovice. Ostrava will be hockey mad all this week!